All weather acrylic coating is a great product for most recreational surfaces. It is low maintenance, durable, inexpensive compared to alternatives, and long lasting. This surface can be applied in a variety of colors and textures. 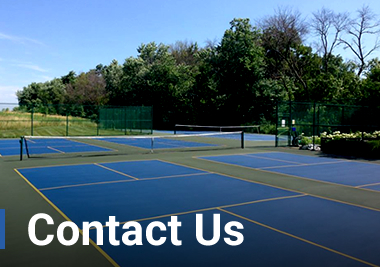 The standard textured acrylic surface is ideal for indoor or outdoor tennis and pickleball and outdoor basketball courts consists of 4 application. The first two applications consist of a product called acrylic resurfacer. Acrylic resurfacer is mixed with silica sand and applied over an asphalt or concrete surface in multiple applications. Acrylic resurfacer is applied with a squeegee to fill in the porous aggregate of asphalt and provide a uniform sand paper finish ideal for color coating applications. On existing courts, Acrylic Resurfacer is used to blend in repairs and provide a uniform finish. 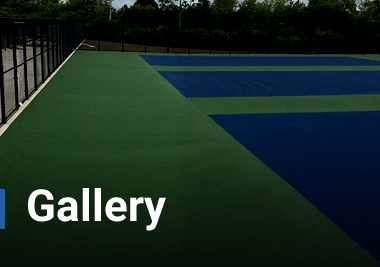 Typically, only 1 coat is required for resurfacing existing courts. The acrylic color comes in a variety of colors. 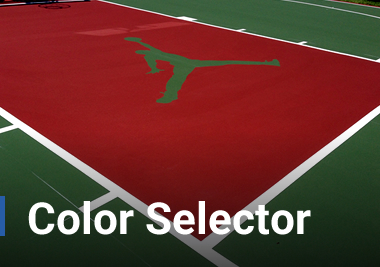 Typically, 1-2 colors are used on the surface of a tennis, pickleball, or basketball court. The acrylic color can be texture with different size and concentrations of rounded silica sand to provide a desired texture. This texture creates the surface pace for a tennis court. The surface pace changes the way a tennis ball responds to the spin of the ball applied by the player. The texture also provides traction. Lines can be applied in any desired layout. Typically, lines are 2” wide for tennis, basketball, pickleball, and volleyball. The lines can be applied in a variety of colors and textures. Colored lines can be applied for multiply games on the same surface. It is very common to see tennis courts with additional lines for pickleball and/or basketball. It is recommended that a colored acrylic surface be repaired as needed and color resurfaced every 5-7 years. This will keep the surface looking good and maintain the desired texture. In addition, 5-7 year color resurfacing will prevent minimal repairs from turning into more costly repairs, asphalt overlays, or replacement of asphalt. A properly built and maintained asphalt surfaces should last 25 + years with proper maintenance. Cushion layers can be added during original construction or during a resurfacing. These layers consist of acrylic resurfacer mixed with recycled rubber instead of silica sand. A minimum of 3 layers can be applied below the sand textured acrylic resurfacer layers. 3-5 coats are recommended for a desirable cushion surface that will drastically reduce stress to a player’s body without affecting ball bounce or traction. Cushion decreases the durability of the surface and should only be applied where there is controlled use. A properly built or resurfaced court should not require maintenance for several years, potentially not for 5-7 years when a color resurfacing is required. Cracks can form for several reasons. They are so common in asphalt that typically “nature” is a reasonable explanation. Most cracks in light use asphalt form because of drastic temperature change. The asphalt expands and shrinks at different temperatures. This movement will stress the asphalt causing it to separate at its weakest point. Asphalt’s age, stability of the sub-base, temperature, quality of asphalt, installation procedure, and several other factors come in to play when determining why a crack has formed. Crack will always form where old asphalt meets new asphalt and where concrete meets asphalt. If cracks form or expansion joints open, they should be sealed as soon as possible to reduce the rate of growth. Simply filling the crack with crack filler will only keep the crack sealed until the next drastic change in temperature, or reduction in temperature below 50°F. Isolated and area reflective crack membranes are available to cover cracks and prevent them from showing through the color coat system. Courts beneath the drip line of trees, with hedges along the perimeter, or exposed to flooding will require power washing every few years. Dirty areas can become very slippery, specifically with the presence of moisture. Dirt or growth, like algae, will hold moisture which will weaken the acrylic surface beneath it and cause premature deterioration. Power washing can remove the color coating and damage the surface. Power washing should only be done by a professional who has experience in washing acrylic surfaces. Stains from beverages should be removed with a light detergent, water, “medium stiff” bristle brush, elbow grease, and a wet vacuum. Weekly, monthly, or even yearly washing is rarely recommended. Puddles or “birdbaths” are areas of standing water deeper than the thickness of a nickel that remains an hour after the court has been flooded with rain at an ambient temperature of 70°F. Tennis courts that are properly constructed have a minimal amount of pitch (.83%-1%), and are flat on a plane, side to side or end to end. If the surface has the proper pitch, most “birdbaths” can be eliminated by leveling with acrylic patch mix. If .83% or greater consistent pitch does not exist, “birdbaths” cannot be removed without changing the pitch of the court. Surfaces coated with improper materials, outside of temperature limitations, over 15 years ago, over uncured asphalt or concrete, or improperly cleaned surfaces will peel or flake. “Birdbaths” and long standing dirt can also lead to peeling. Typically peeling will be localized but sometimes it affects the entire surface. If there are signs of peeling, blistering, or flaking all coatings must be removed prior to applying a new acrylic color coat system. FOR MORE INFORMATION REGARDING REPAIR METHODS SEE THE TECHNICAL DATA PAGE. The video above and image below show the process of applying the Truebounce surface over an existing cracked asphalt tennis court. Visit the truebounce website for more information.